Here in this term paper description is given about a type of polyamide fibre i.e. 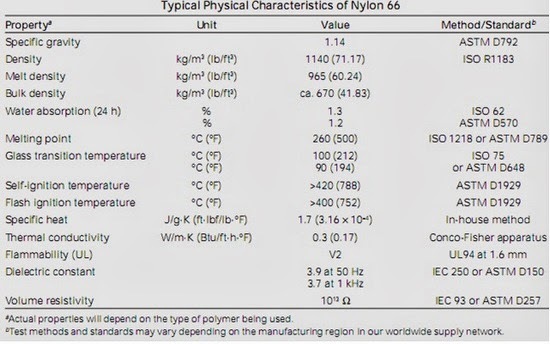 Nylon-66. Here in this paper the methods of preparation of monomers, polymerisation, manufacturing methods of nylon-66, spinning process to obtain fibres, different properties and wide range of applications and uses of nylon-66 are discussed. In this paper data are represented in the form of flow charts, histogram and pie charts for easy understandings. This paper covers all the processes related to nylon-66. There are several polyamides, which have been developed as fibres. The generic word for these products is 'Nylon'. Nylon is defined as a generic term for any long chain synthetic polymeric amide which has recurring amide groups as an integral part of the main polymer chain and which is capable of being formed into a filament in which the structural elements are oriented in the direction of the axis. DuPont researchers led by Dr. Wallace Carothers, invented nylon-66 polymer in the 1930s. 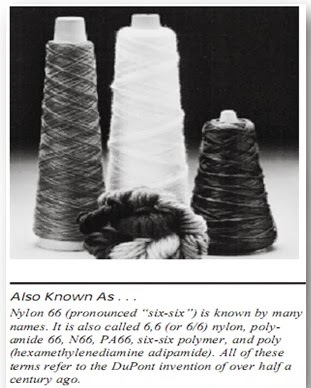 Nylon, the generic name for a group of synthetic fibers, was the first of the “miracle” yarns made entirely from chemical ingredients through the process of polymerization. Nylon 66 polymer chip can be extruded through spinnerets into fiber filaments or molded and formed into a variety of finished engineered structures.Nylon-66 fibre is a member of the large group of polycondensation products of dicarboxylic acids and diamines with fibre forming properties. The individual member refers to the number of carbon atoms respectively in the diamine and dicarboxylic acid chains. Nylon-66 (polyhexamethylene diamine adipamide) is a polyamide made from adipic acid and hexamethylenediamine by polycondensation. The resulting polymer is extruded into a wide range of fiber types. The fibers are drawn, or stretched, in a process that increases their length and reorients the material’s molecules parallel to one another to produce a strong, elastic filament. The thermo-plasticity of nylon permits permanent crimping or texturing of the fibers and provides bulk and stretch properties. 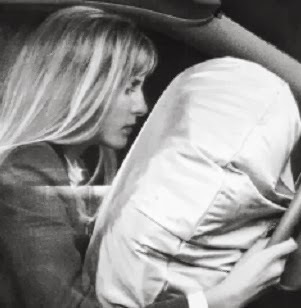 The nylon developed by Carothers at Du Pont was nylon 66. Because of the importance of starting out with equal amounts of the two reactants, salts of the diamine and of the diacid are made and then used in the commercial synthesis of nylon 66. (a) Fundamental research activities which provided the foundation for the development. 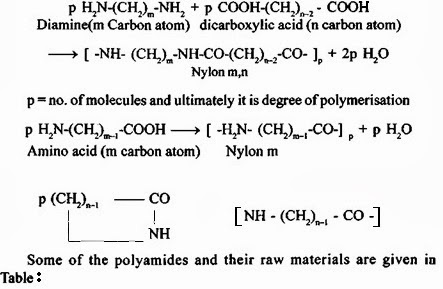 (b) Different types of polyamides, their synthesis, manufacture and their suitability for use as a new fibre. This includes all types of polyamides like aliphatic, aliphatic-aromatic and fully aromatic polyamides. (c) Commercial production of the fibres. (d) Development of the properties and serviceability of the fibres. (b) Nylon, made from amino acid, is classified according to the number of carbon atoms present in the acid. It will have only one number. For example, Nylon 6 can be made from amino acid having 6 carbon atoms i.e., amino caproic acid or its condense product caprolactum. In 1939, the introduction of nylon into sheer stockings revolutionized the women’s hosiery market. Silk and cotton were quickly replaced by this more durable and easy-care product. Nylon soon found its way into other end uses. In parachutes and fishing line, nylon provided a moisture- and mildew-resistant replacement for silk. In flak vests, nylon offered a strength and durability previously unattainable for protection against shell fragments. And, when used as aircraft tire reinforcement, nylon enabled heavy bombers to land safely on improvised air strips. 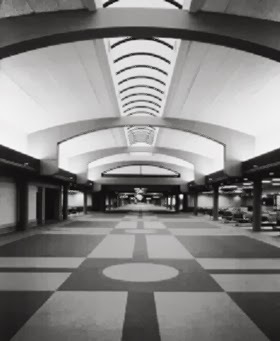 Today, as the global leader in nylon polymer, DuPont offers a wide range of nylon-66 polymer types for use in industrial, textile, and furnishing/floor covering applications. Thermal stability in high-temperature coating operations. The processing of nylon usually begins by conditioning the received chip, with or without an increase in the asreceived molecular weight. The chip is then melted, usually in a screw-type extruder, and spun into filament form. The filamentsare then packaged in a process that may include drawing, bulking, or cutting into lengths of staple. 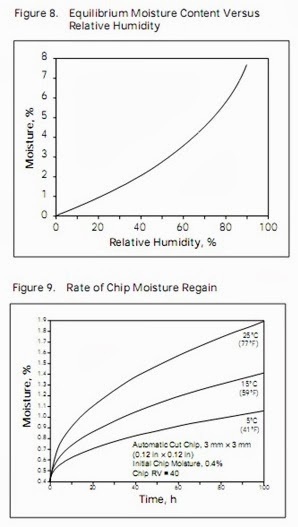 Chip is normally conditioned in an inert atmosphere at temperatures in the 120–180°C (248–356°F) range. Processors may employ higher temperatures to increase molecular weight, especially for industrial uses. Both batch- and continuous-type conditioners may be used. It is important to avoid excessive exposure of the chip to oxygen, which may lead to degradation and yellowing of the product. Remelting is normally performed in a single or twin screw-type extruder, although the melting can be done in a heated grid-type melter. Single screws are preferred for smaller spinning plants because of their simplicity. Twin screws are preferred for larger installations or when more extensive mixing during remelt is required. Equipment must have the capability of heating the polymer to 280–290°C (536–554°F). Handling of the Molten Polymer Nylon 66 may produce undesirable cross-linked material (gel) if processing temperatures and holdup times are not properly maintained. Care must be taken to eliminate areas of stagnation in the screw and in the polymer piping. Good engineering practices require the application of optimum shear rates and frequent mixing of the melt. Conversion—Molten Polymer to Final Product Form Due to the wide variety of nylon 66 products that can be produced and the range of processing equipment available, it is beyond the scope of this bulletin to specify ideal processing conditions. In general, most modern filament-producing equipment will process nylon 66 polymer adequately. Adipic Acid (ADA) and Hexamethylene diamine (HMD) are used as raw materials for Nylon-66 Polymer. 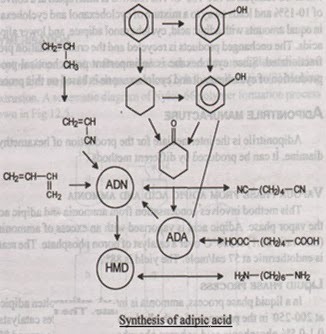 The schemes of preparation of adipic acid and hexamethylene diamine are shown in Figure. Mostly cyclohexane (CH), cyclohexanol (CHL) and cyclohexanone (CNH) are used to obtain adipic acid (ADA). For oxidation, only nitric acid and oxygen can be used economically. The most important process is the oxidation of cyclohexanol with 50% nitric acid at 60-70°C. In a stainless steel kettle the cyclohexanol is added to the acid under cooling and stirring, the acid is crystallized from water. The yield exceeds 85%. The oxidation of cyclohexanone with nitric acid requires higher temperatures. Also cyclohexanone is oxidized in the presence of acetic acid as diluent and with 0.1% manganese acetate or nitrate at 80-1.00°C. The yield is about 70%. The simplest method for the production of adipic acid is direct oxidation of cyclohexane. Most useful is the catalytic oxidation with air by soluble Mn or Co catalysts at 120-150°C. The reaction is interrupted at a conversion of 10-15% and leads away to a mixture of cyclohexanol and cyclohexanone in equal amounts with adipic acid, cyclohexanol adipate, and lower aliphatic acids. The unchanged product is recycled and the crude oxidation product fractionated. Since cyclohexane is an important petrochemical product, production of cyclohexanol and cyclohexanone is based on this process. This method involves condensation from ammonia and adipic acid in the vapor phase. Adipic acid is vaporized with an excess of ammonia gas (mol. ratio 20:1) at 350°C over a catalyst of boron phosphate. The reaction is endothermic at 57 cal/mole. The yield is 88%. In a liquid phase process, ammonia is introduced in molten adipic acid at 200-250 in the presence of such alkyl or alkyl phosphates catalysts like 0.1 -0.5% phosphonic acid or boron phosphate. The yield is around 88%. 1, 4 Dichlorobutane can be obtained by addition of chlorine to butadiene. This can be converted to 1, 4 dicyanobutane by NaCN. Dry NaCN is mixed with adiponitrile as diluent and the calculated amount of 1, 4 dichlorobutane is added at 185-190°C. By addition of water, the oily layer is distilled. The yield is about 95%. HMD is manufactured exclusively by the hydrogenation of the dinitriles. Palladium is used as catalyst. Another effective catalyst is cobalt oxide mixed with calcium oxide. In all cases, the reaction must be carried out in the presence of excess ammonia. Pure HMD is a colourless crystal, melting at 40°C, B.P. 100°C, soluble in water, and alcohol. Nylon-66 production from adipic acid and hexamethylene diamine comprises four steps: (1) Salt preparation (2) Polycondensation (3) Melting. (4) Extrusion. 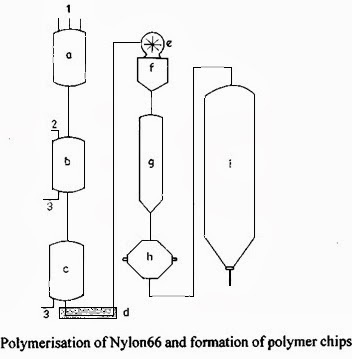 A schematic diagram of Nylon 66 polymer formation process is shown in Figure. High molecular weight nylon 66 is only obtained if equimolecular amounts of the components are used. An excess of the components would terminate the chain by formation of an acid or amino end group. So stoichiometric portions of hexamethylene diamine and adipic acid must be used (amine to acid of 1:1). For this reason, the salt of 1 mole adipic acid and hexamethylene diamine (AH salt) is used as intermediate. The hexamethylene diamine is used as a 60-70% solution and the adipic acid as a 20% solution. The monomers are fed and mixed in the mixer and transferred to the prepolymeriser. Methanol is added and the reaction takes place. Methanol can be refluxed. The separated salt is centrifuged and washed with methanol. It is stored as a 60% solution in distilled water. It is a snow white crystal (mp - 190°C). Owing to all these constraints, batch processing is used. The concentrated salt solution is then fed to the polymerisation reactor, where the second-stage of the reaction begins (Fig 12.5 c). 60% Aq. Solution of the salt in distilled water, 0.5% acetic acid (stabilizer) is pumped into an autoclave. Increased temperature and pressure are used to initiate the polymerisation reaction. So the autoclave is heated to 275°C. The pressure is generally kept constant (1.8 MPa). Before the reaction, the autoclave is purged with very pure nitrogen (less than 0.005% oxygen) to avoid degradation and discoloration of the polymer. When the temperature of the batch reaches 275°C, the pressure is allowed to fall to atmospheric pressure. The batch is held at 270°C and atmospheric pressure for half an hour to allow removal of the water vapor. The heating is continued until all water has been distilled off. Towards the end of the distillation, the autoclave is evacuated. The polymer is obtained as a clear, low-viscous melt which is removed from the autoclave by pressure with pure nitrogen. The melt is extruded through the bottom of the reactor to form a ribbon. It is solidified and cooled in cold water cut into chips and dried. The dried chips are stored in a storage hopper in a similar manner like that of Nylon 6. Nylon has sufficient stability of the melt and adequate viscosity. So it can be spun in the molten state with usual velocity (upto 2000 m/min). The polymer chips are fed to the hopper and then it is melted and homogenized in an extruder. The molten polymer after filtration is passed to the spinnerets. The melt is pumped through this system and solidifies immediately on contact with air. Cross air flow is used for solidification. The melting temperature for spinning is around 300°C. After spinning like nylon 6, the flows are stretched to get the desired elongation. The different parameters which can be varied to influence fibre properties are: (a) Mass output, (b) Winding speed, (c) Spin draw ratio, (d) Draw ratio and (e) Draw temperature. The properties which will be considered are: tensile strength, elongation, modulus, crystallinity and orientation. Like Nylon 6, different types of Nylon 66 fibre exhibit different physical properties. Because of different structure, the melting point will occur in the range of 249°C to 260°C. The glass transition temperature of this fibre is in the range of 29°C- 42°C. The softening temperature i.e., the sticking temperature is 230°C. The fibre discolors, when kept at 150°C for 5 hours. The heat deflection temperature is 70°C. The decomposition of this fibre starts at 350°C. 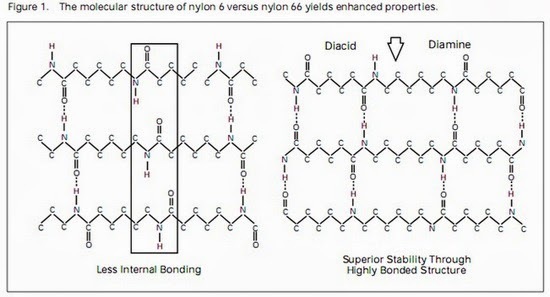 Nylon 6, 6 fibres is more resistant to acids or alkalis in comparison with nylon 6 fibre because of light intermolecular forces present in the structure. The fibre is unaffected by most mineral acids, except hot mineral acids. The fibre dissolves with partial decomposition in concentrated solutions of hydrochloric acid, sulphuric acid and nitric acid. The fibre is soluble in formic acid. In a similar way, the fibre is attacked by strong alkalies under extreme conditions otherwise it is inert to alkalis. The fibre can be bleached by most of the bleaching agents. The fibre is mostly insoluble in all organic solvents except some phenolic compounds. The fibre has excellent resistance to biological attacks. Prolonged exposure to sunlight causes fibre degradation and loss in strength. The fibre can be dyed by almost all type of dyestuffs like direct, acid, metal-complex, chrome, reactive, disperse and pigments. However only acid and metal complex dyes are preferred because of higher fastness properties. When processed into fiber form, nylon 66 polymer offers many advantages for customer applications. Nylon 66 fabrics withstand coating temperatures with PU, PVC, and rubber up to 200°C (392°F) and display good dimensional stability for coating integrity. Carpets of nylon now account for nearly 70% in a market that was once the exclusive domain of wool yarns. A full line of dye variant polymers for yarn styling formulations. Automotive: Bearings, slides, door handles, door & window stops. Mech. Engg. : Drive gears, bearings, fish plates for railways lines tubing. The degree of polymerization of a polymer is directly proportional to molecular weight and is commonly measured by a solution viscosity technique. 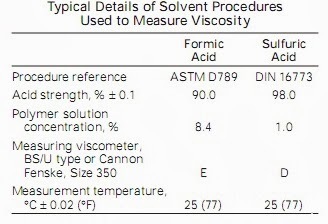 Methods of Measurement Common solvents used for viscosity measurements of nylon 66 include both formic and sulfuric acids. The details of these procedures are summarized in Table. RV is determined by comparing the time required for a specific volume of polymer solution to flow through a capillary tube with the corresponding flow time of the same volume of pure solvent. Results are corrected for moisture content of the sample; alternatively, the sample is dried to a low moisture level. Values quoted in specifications are those measured in 90% formic acid. Figure.6 shows the typical relationship between RV in 90% formic acid versus 98% sulfuric acid. A major nylon asset is its ability to accept a wide range of dyestuffs. These include both acid and premetallized dyestuffs that associate with the terminal amine groups of the polymer. 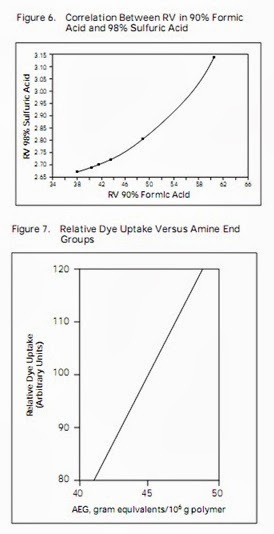 The concentration of these end groups is an important factor in controlling dye ability (see Figure7). The technique commonly used for measuring AEG involves dissolution of polymer in 68/32 wt% phenol/methanol solvent and potentiometric titration with 0.05 m hydrochloric acid using commercially available equipment. Results are corrected for moisture and titanium dioxide content. For typical textile grade products, amine end Group concentration is usually within the range of 35–50 and is expressed as gram equivalents/106 g of polymer. Nylon is a relatively hygroscopic polymer. Nylon 66 leaves our production plant with low moisture content (typically <0.3 wt %). However, the product can absorb more moisture (up to8 wt %) depending on the relative humidity (see Figure 8) and length of exposure time (see Figure 9). Customers must take precautions to keep the product free of moisture. After all the research works and information in this term paper we conclude that Nylon 6,6 is a semi-crystalline, off-white engineering thermoplastic that is the strongest and most abrasion resistant unreinforced aliphatic nylon with better low temperature toughness than Nylon 6 or acetal. Its very low melt viscosity can give industrial processing difficulties and weathering can cause embrittlement and color change unless it is stabilized or protected. Available with a wide range of fillers notably glass fibre, which gives a marked increase in stiffness, and solid and liquid (oil) lubricants. Super-tough grades are also available whose impact properties and low notch sensitivity are amongst the best of all engineering thermoplastics. Nylon 66, polyamide fibres, A Text Book of Fibre Science and Technology S.P. Mishra, New Age Publishers. Advances in nylon 6, 6 Fibre Science and Technology, By Premamoy Ghosh. Nylon manufacturing, Modern Fibres edited by J.W.S HEARLE. DuPont Nylon, DuPont Singapore (PTE) Ltd, and 07-01 World Trade Center1 Maritime Square Singapore 0409, Telephone: 65-279-3497, Fax: 65-272-7494. Properties of nylon 66, Textile research journal, http://trj.sagepub.com/. Technical details of nylon 6, 6 fibres, http://www.btraindia.com/articles_indian.asp. 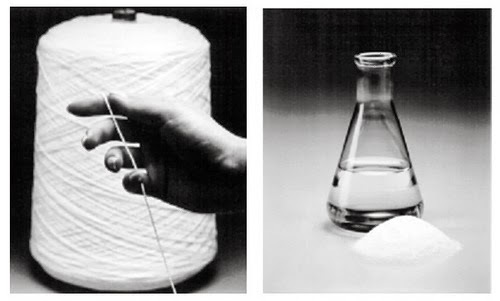 Testing of textile fibres, by J.E. Booth.